Excellent moulding; crisp surface textures; high level of detail. Unsurprisingly, the origins of the Yak-3 go back to an original 1941 design for what was to be designated as the Yak-1. At the same time, an alternative design named I-30, was also proposed, which was a smaller version of the Yak-1, carrying a spinner mounted cannon and two synchronised machine guns in the upper cowl. It also carried two wing-mounted cannon. Whilst this machine had metal wings that were fitted with slats for operations from smaller airfields, plus better handling, a prototype with simpler wooden wings, without slats was also flown. Unfortunately, this machine crashed and was destroyed. Due to Hitler’s invasion of the Soviet Union in 1941, and raw materials becoming scarcer as Operation Barbarossa snaked through the Motherland, the Yak-3 was shelved. As time progressed, the Yak-1 project did spawn another number of other variants, such as the Yak-7 trainer/fighter and Yak-9 heavy fighter, which, as Russia’s war fortunes changed, allowed for full scale production. It became apparent that Russia still needed a nimble fighter with a high power to weight ratio, that could take on the best of what the Luftwaffe was flying, and the I-30, or Yak-1M, was revisited. Trials for the new machine began in late 1943, and finally, the Yak-3 entered service in the summer of 1944, as Germany’s fortunes really were fading fast. The Yak-3 had a redesigned wing, and the aircraft was of mixed metal and wood construction, and fitted with a Klimov VK-105PF-2 V-12 liquid-cooled piston engine, delivering 1,300hp. Whilst retaining the spinner cannon and the two cowl mounted MGs, the wing cannon were omitted. With an impressive handling and combat performance that more than matched their Luftwaffe fighter counterparts, the Yak-3 with a top speed of over 400mph, was very much liked by those who flew it, and was said by a French fighter ace, to be superior than the P-51D and Spitfire. The type wasn’t without its problems though, including poor performing glues that cause plywood surfaces to break away, plus an unreliable engine and dodgy pneumatic systems that controlled the flaps, brakes and undercarriage. These were never fully resolved. By the time production ceased, almost 5000 Yak-3 had been built. The type was officially retired in 1952, and served with French, Polish and Yugoslav air forces, as well as its native VVK. Special Hobby seem to be on a bit of a roll at the moment, with the recent review of their long-awaited Hawker Tempest Mk.V. Whilst the Tempest seemed to have been in development for an eternity, the Yak certainly wasn’t so. However, this release has been no less anticipated. 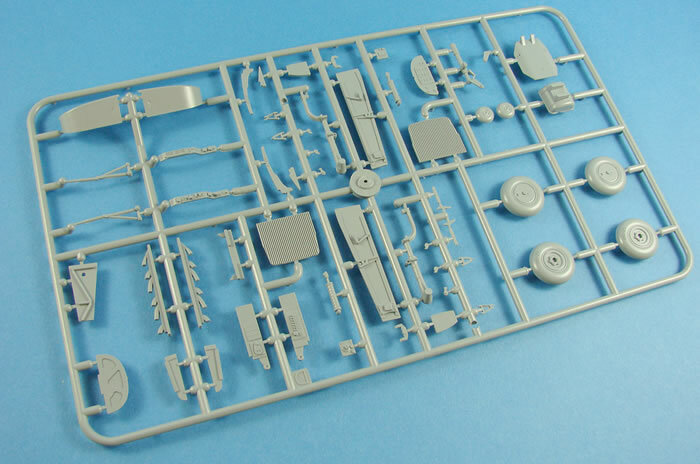 Like the Tempest, Special Hobby has released this in their ‘Hi-Tech’ format, meaning that it comes with a number of resin parts and a smattering of photo-etch parts. A set of canopy masks is also de rigueur with this type of release. In all, a pretty comprehensive package that will only benefit from whatever else you decide to enhance it with. The Yak-3 is packaged in the same style and size of box as the Tempest, and as there aren’t as many parts here, things aren’t too tightly packed in there too. I have to admit that I really do like their choice of box artwork, and it’s been much lauded on various internet modelling. The box sides show the various extras afforded by this ‘Hi-Tech’ boxing. Removing the lid is easier said than done. This must be the best fitting box I’ve seen. It certainly takes some effort to remove the lid. 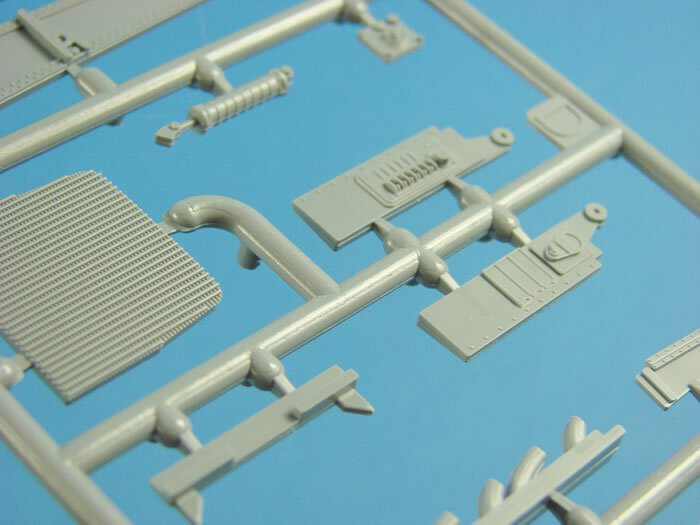 Once inside, you’ll find FIVE sprues of medium-grey styrene packed into a single, re-sealable sleeve, a separate sleeve with ONE clear sprue, a CMK blister package containing the resin, photo-etch and vinyl masks, and one last sleeve with two decal sheets. Lastly, a glossy, colour-printed A4 manual completes the ensemble. The “Normandie-Niemen” packaging for this release relates to a regiment of the French Air Force that fought on the Eastern Front. This Group re-equipped with the Yak-3, scoring with it the last 99 of their 273 air victories against the Luftwaffe. 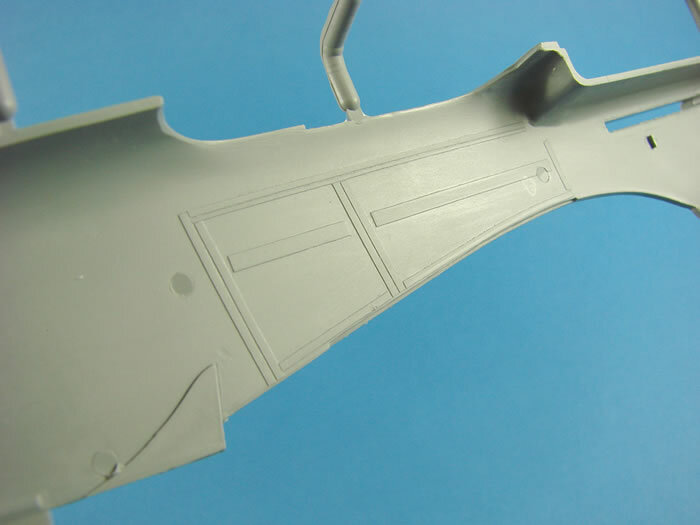 Both fuselage halves are included on this sprue, as is the upper gun cowl and two parts of the lower radiator intake channel. 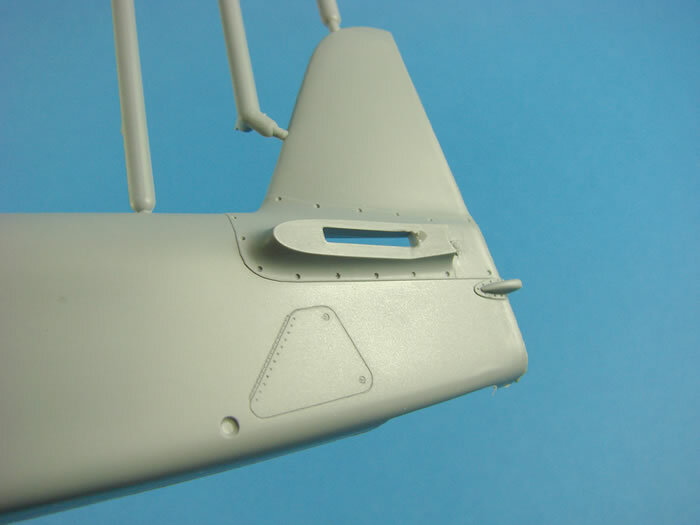 Firstly, the overall finish on the parts is good, with delicate surface detail, finely engraved panel lines (where appropriate on a mixed wood and metal aircraft), very fine rivets and fasteners, and well defined stabiliser tab location points. Moulding isn’t done in highly polished moulds, and as a result, the surface is satin in finish. You might find that a gentle buffing of the plastic, and a fine polishing will benefit the eventual paint layer you apply. Inside the fuselage, some very subtle sidewall cockpit detail is included, but this won’t be seen easily through the tubular cockpit tub detail. A couple of ejector pin marks exist in this area, but again, looking at the kit more closely, I’m sure they won’t be seen. 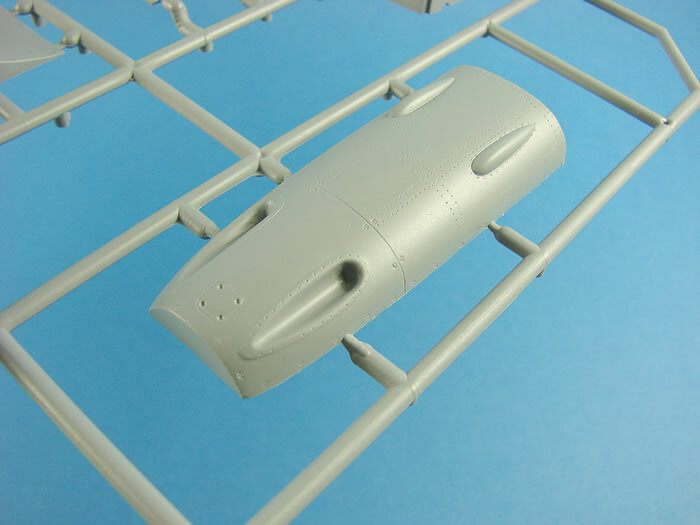 Some excellent tail wheel well detail is also moulded, which is nice when you consider you’d really need to pop a flashlight over the area to see it! I think the upper cowl is separate simply because of the bulges and gun troughs that are there, and moulding them in situ would have caused problems with tooling undercuts etc. 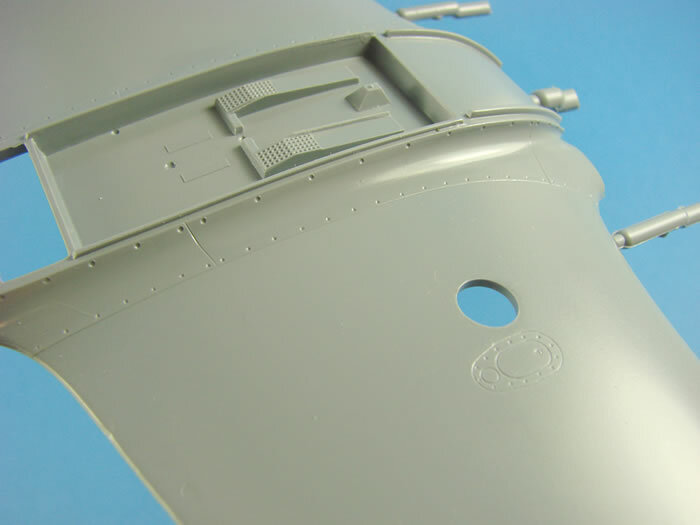 The cowl looks very good, with more beautifully defined detail such as rivets, panel lines and port access detail. 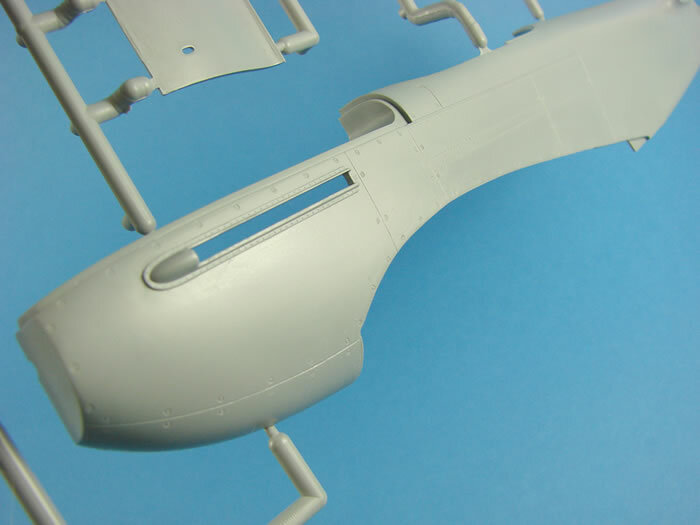 Gun trough fairings are also nicely defined. Please note that none of these parts, here or on other key areas, has any form of locating pin arrangement, unlike the recent Tempest design. This is quite normal for many of the smaller companies producing our kits. I certainly don’t find the lack of these locating aids to be a hindrance. In fact, I usually gently rub the joint faces of these parts over a large sheet of fine abrasive paper first, to ensure a perfect mating joint. 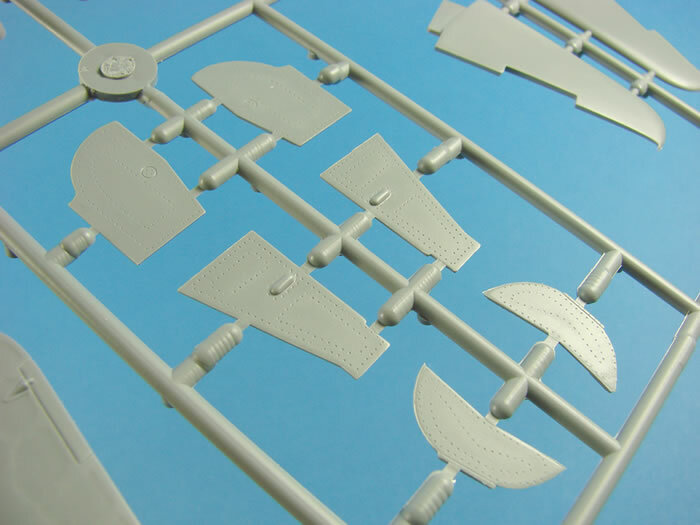 This sprue contains the upper and lower wing parts, and the sprue is split simply to allow it to fit within the confines of the box. As you can see, these parts are full span, so there’s no having to determine any dihedral etc. It’s all done for you! 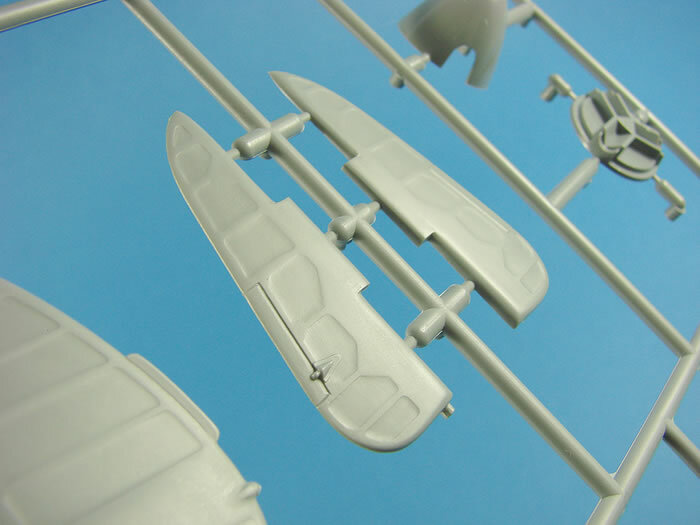 You’ll also note that the flaps and ailerons are moulded in situ, which would make it a little harder for you if you wanted to pose these dynamically. It’s certainly no issue for me, as I imagine it wouldn’t be for the majority of those wanting to build this kit. 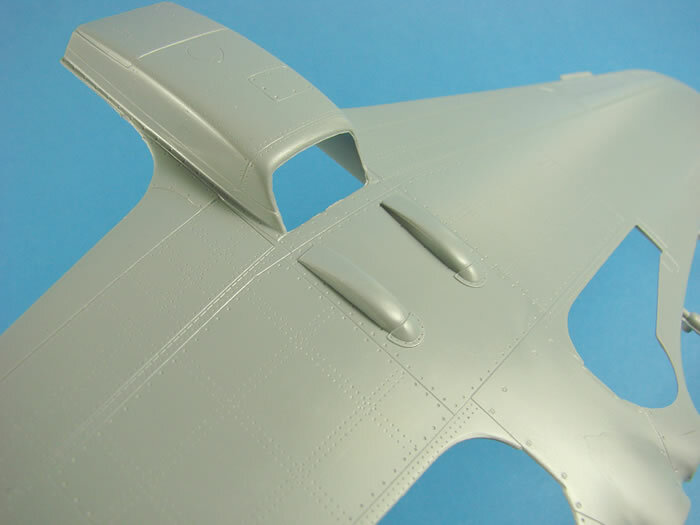 Surface detail is extremely minimal as befits a wooden wing, but the ailerons with their rib and fabric detail, are excellent. The wing fairing is also nicely rendered, with its fastener detail, and the two holes you see in the upper wing are for the wing-mounted fuel gauges. The gauges themselves are supplied as decals that fix to the underside of two clear plastic lenses. The centre section of the upper wing contains the cockpit floor with its foot plates and control stick base. 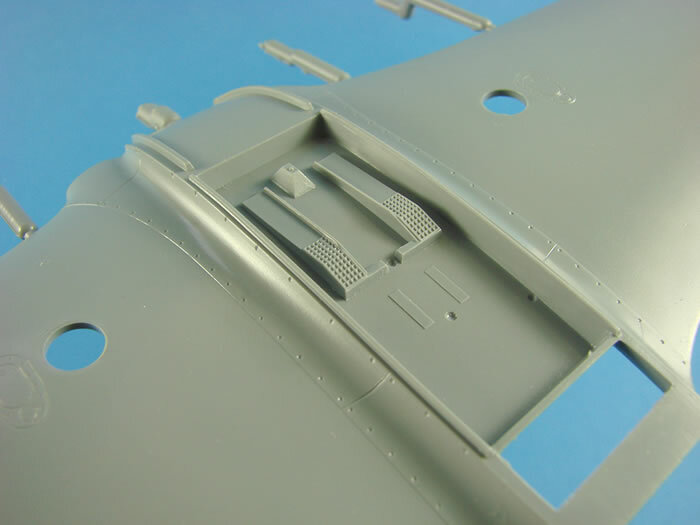 Note that the radiator unit is moulded in place on the lower wing, and of course you need to add the channel parts to this before you fit the upper wing plate as this area would be impossible to access afterwards. 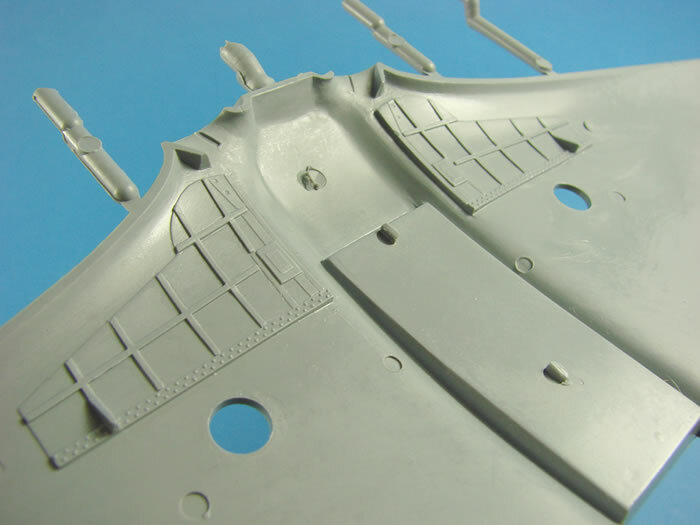 We have more metal plate and rivet detail on the undersides, with the centre section and landing flaps exhibiting some clean rivet and panel line detail. 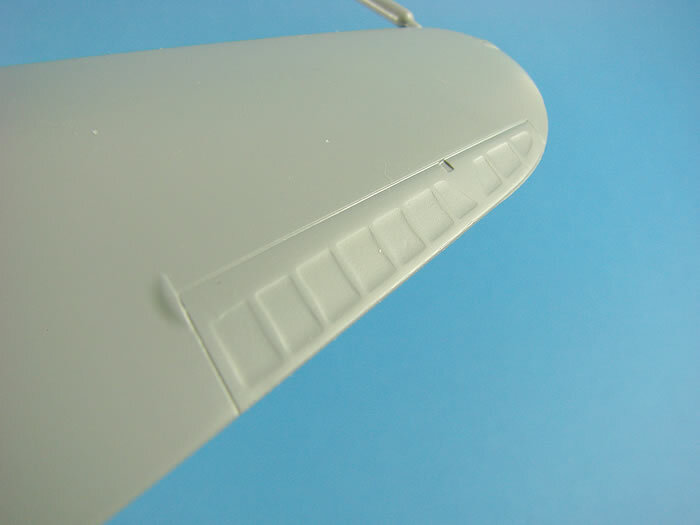 Internally, there are recesses for the landing gear bay walls, and the inside of the upper wing contains some nice, sharp details for the ceiling of the bays. Again, I will slightly buff out the surfaces of these parts and give them a subtle polishing before I begin work. Special Hobby has moulded the stabilisers here in the traditional way, with upper and lower tail planes and elevators. 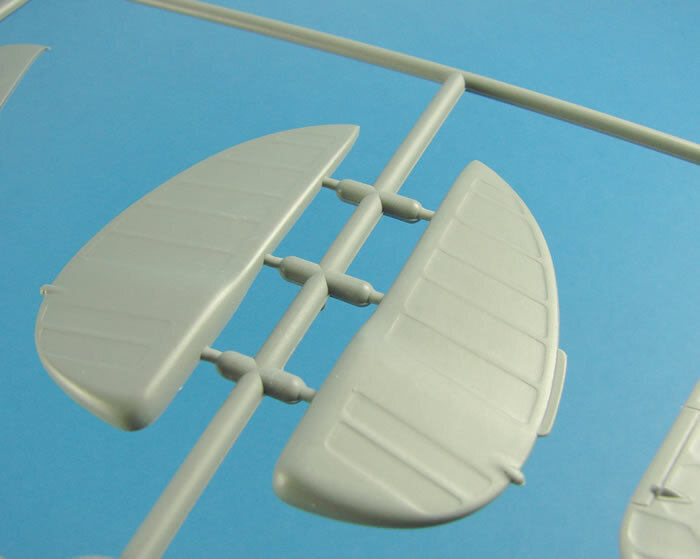 As the stabilisers were wooden, no detail is moulded here, but the elevators and the rudder parts exhibit the same nicely rendered rib and fabric detail as the wing ailerons. 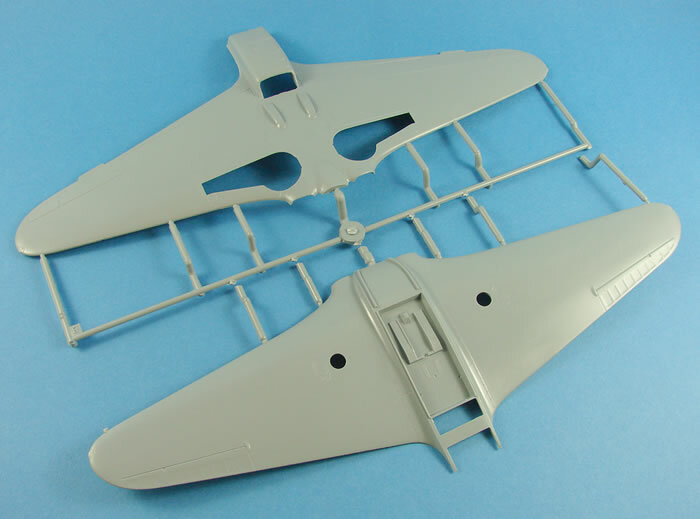 Other parts here include separate prop blades with a two-part spinner, and a full complement of main undercarriage gear doors, with external rivet detail and internal structural elements, all clean and ready to go! 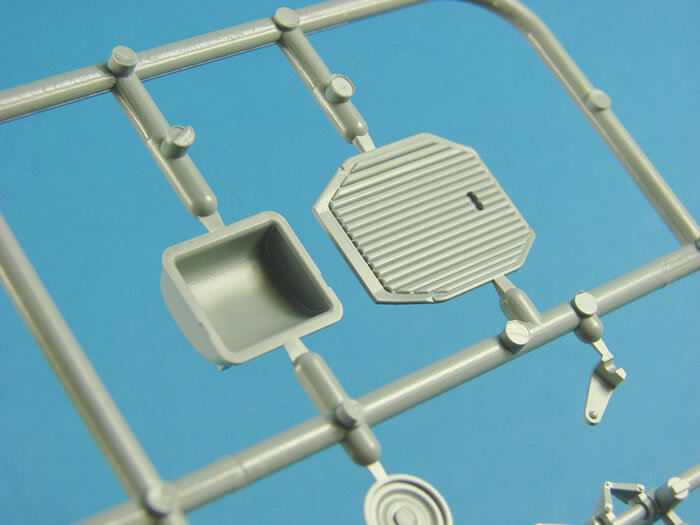 This is the first sprue where we see a number of parts that are designated as ‘not to use’, because this boxing has a number of resin replacement parts. More on those soon. 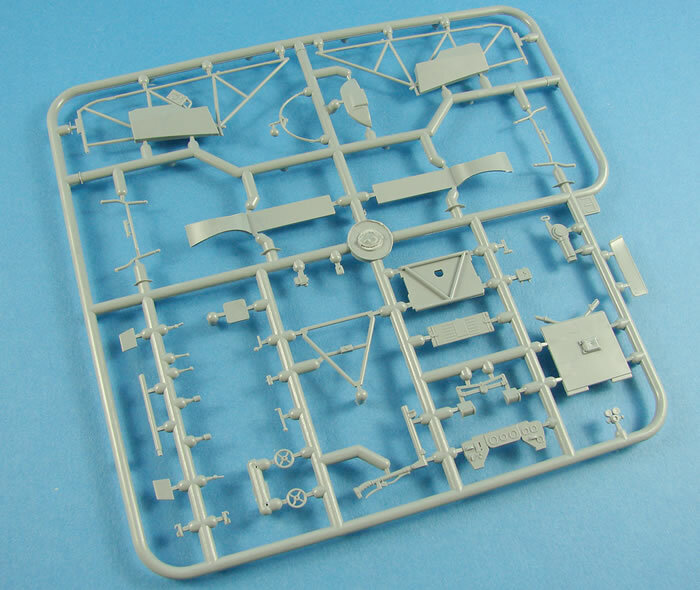 This is very much a ‘detail parts’ sprue, and here you will find three of the four main gear well walls, the main gear struts and tail wheel strut, cockpit instrument consoles, cockpit seat tub and armoured backrest plate, cockpit sidewall instrument panels, upper main instrument panel, tailwheel mounting plate, radiator actuator rods, and numerous other small parts that fit around the cockpit and wheel wells, such as small ribs etc. 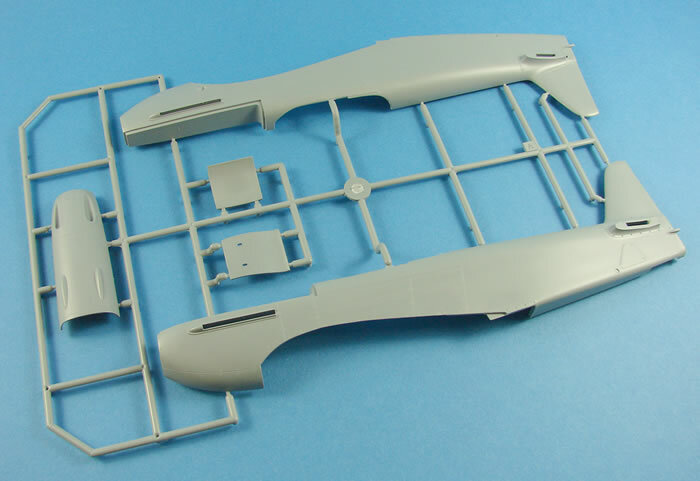 A small number of parts not for use include the wheels and exhausts. 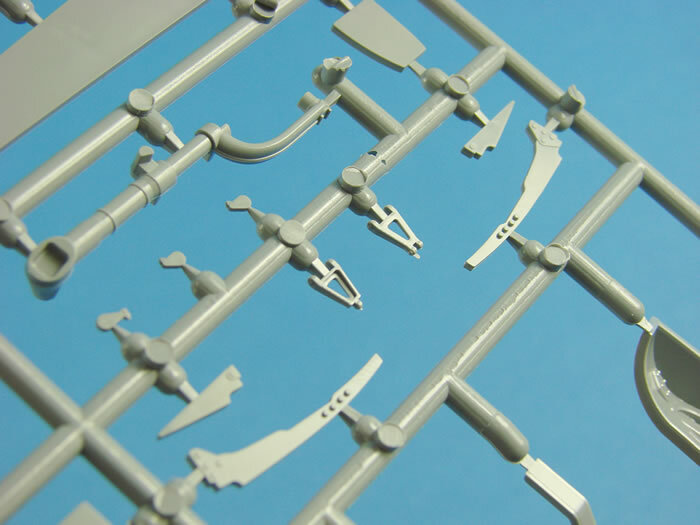 I note that the moulding of this sprue and Sprue E, are done in what appear to be more refined tooling, with the parts have a shiny finish to them, unlike the main pieces (wings and fuse etc.) Detailing on the parts here is also extremely sharp, akin to some of our more mainstream manufacturers. Of note at this juncture is the assembly of the main gear wells. Now, I’m not totally 100% on this, but it appears that you have to follow the instructions in the connection of the main gear struts to the wheel wells, including the gear doors, BEFORE they are fitted to the main wing. There may be a way around this if you want to add the struts later in construction, but for the life of me, I can’t see a way around this. It’s a rather unusual system of construction that will of course make your masking a little harder later on, but until I build this for myself, I won’t know if the construction sequence here is flexible or not. 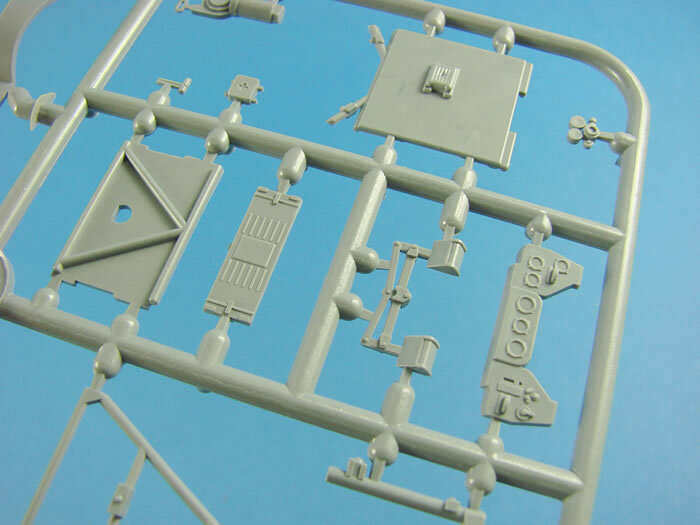 We are now onto the last of our grey sprues, but this one is pretty important as it includes both of the tubular cockpit side walls, and other frames and plates that make up this area. 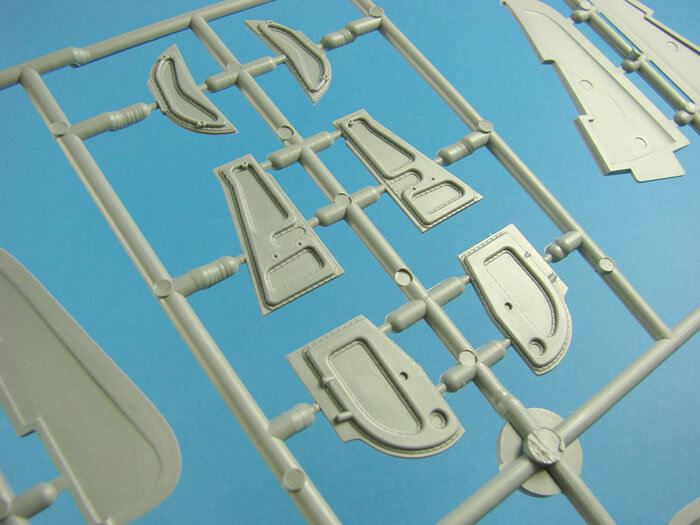 Those walls are moulded with their side console panels, sans instrumentation, as those parts were moulded on the previous sprue. Remember to use a razor saw for these fragile, but beautifully moulded parts. 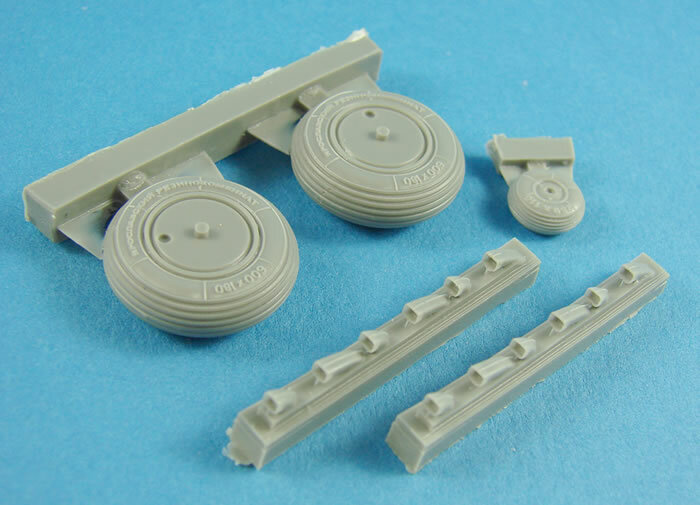 Seems on these, and the main gear door frames, look to be virtually non-existent. I’m very pleased to see that. 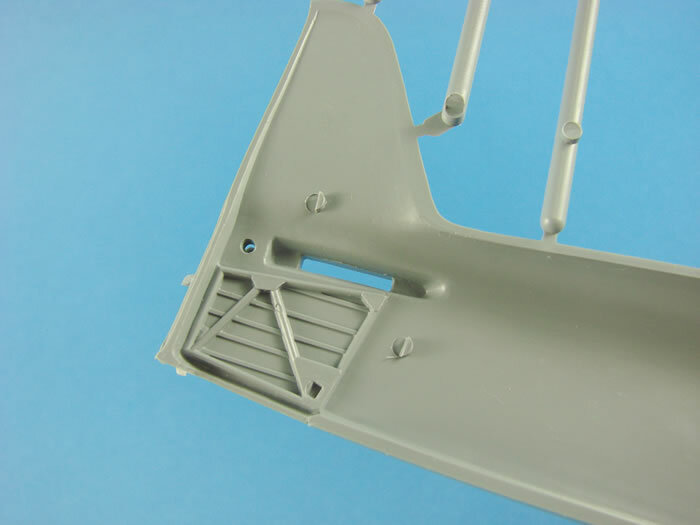 A good number of other cockpit parts are moulded here such as the single piece control column and torsion bar, trim wheels, levers, rudder pedal bar, rear radio receiver shelf, first aid kit box etc. You will need to modify the rudder pedal bar and remove the pedals themselves, in favour of resin replacements. Other parts here include the remaining gear bay walls, instrument panel coaming and lower instrument panel. 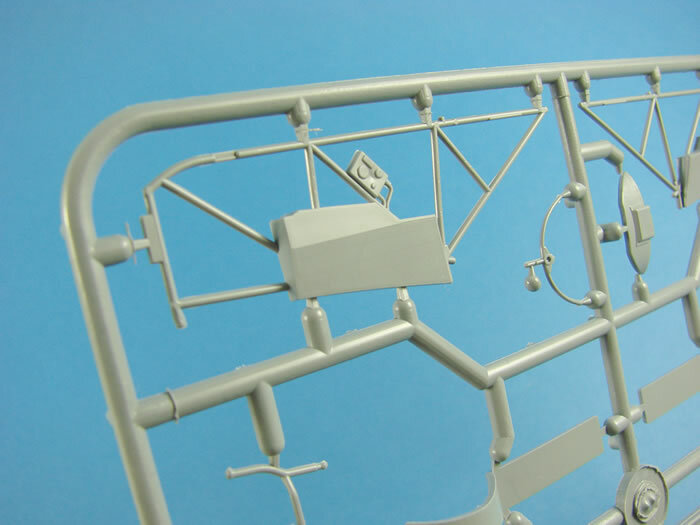 Special Hobby has thoughtfully supplied two canopies with this kit. One of them is a single piece unit, for it you want to pose it closed up. The other is a three-part system that allows us to pose it with the hood slid back. The Yak-3 canopy does look odd, as the only frame lines there are, are around the edges. There is no armoured windshield on this aircraft. Clarity is very good, and the frame lines are defined well enough for us to easily place the vinyl masks for the painting phase. 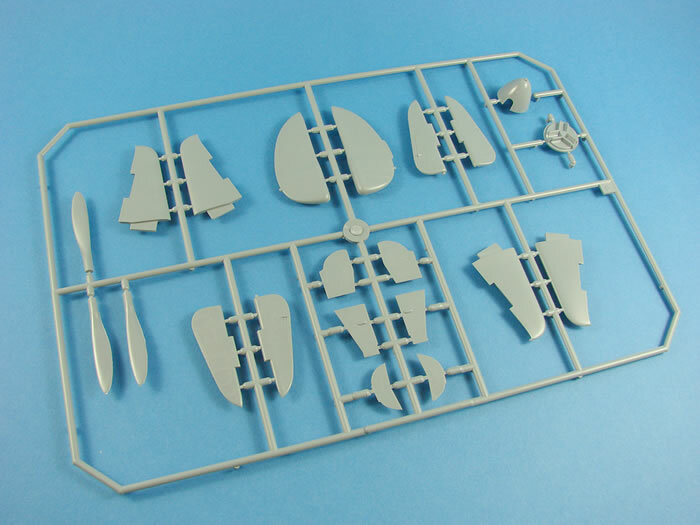 Other clear parts are for the wing compasses, and also an armoured glass panel to the rear of the pilot’s head. 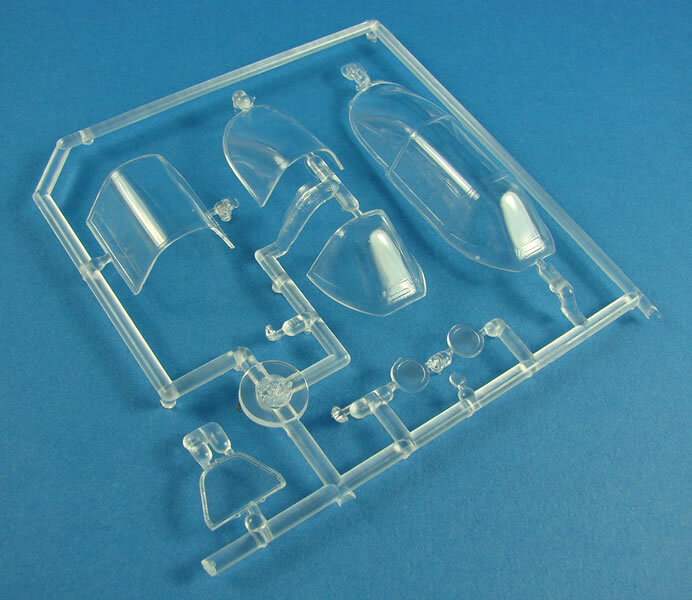 If you’ve ever seen a CMK resin set, then this sort of blister pack will be very familiar to you. Here, it contains the resin, PE and vinyl mask set. 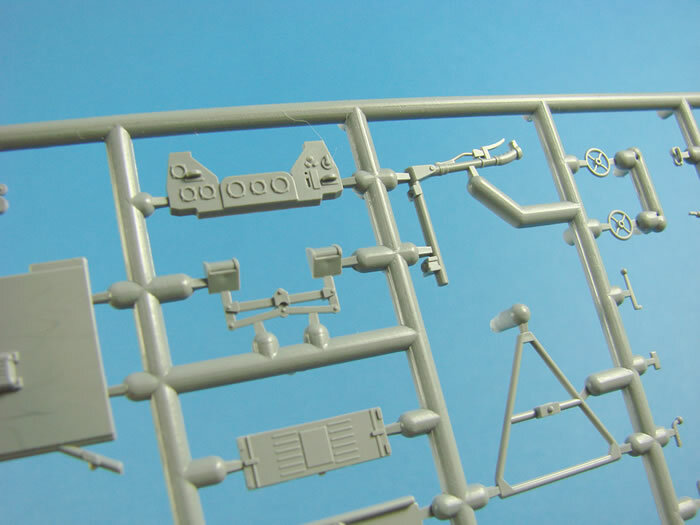 Resin parts included in this release are for the radio receiver, wheels, exhaust manifolds, machine guns for the upper cowl, rudder pedals, fuel primer for cockpit, and main gear strut locking latches for the wheel bays. The resin used is a mid-grey type, and you will of course need to remove them from their casting blocks. 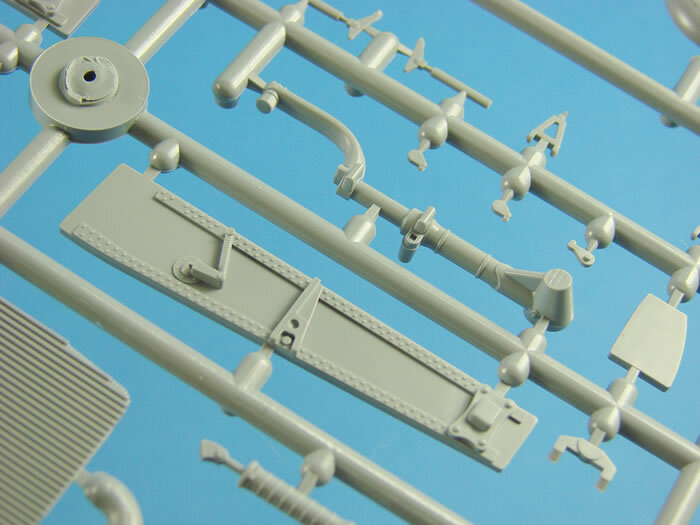 Casting is excellent, as it generally the case with CMK, and the instructions are pretty self-explanatory as to where and how the parts fit. There aren’t too many PE parts here, and they come on a single, small fret. Parts include the seatbelts, control column trigger, tail wheel oleo scissor and gun sight targeting hairs. Production is very good, with nice, small connection points with the fret. 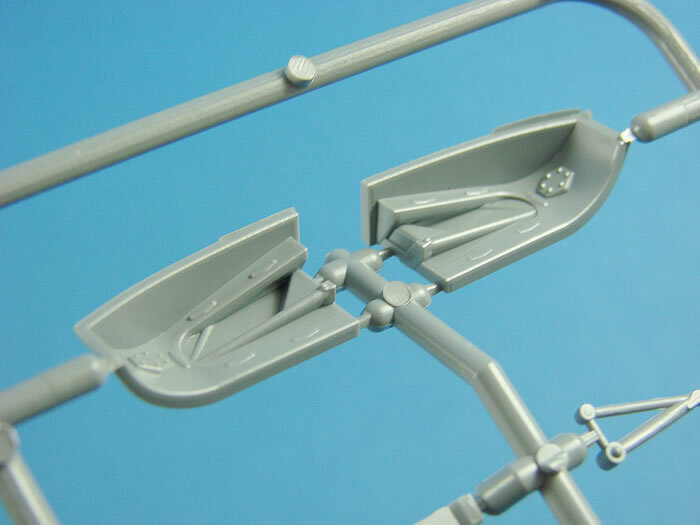 Masks are included for the canopy, wheels, armoured headrest and wing compass units. Made from sharply cut vinyl, the quality looks good, with no shrinkage. 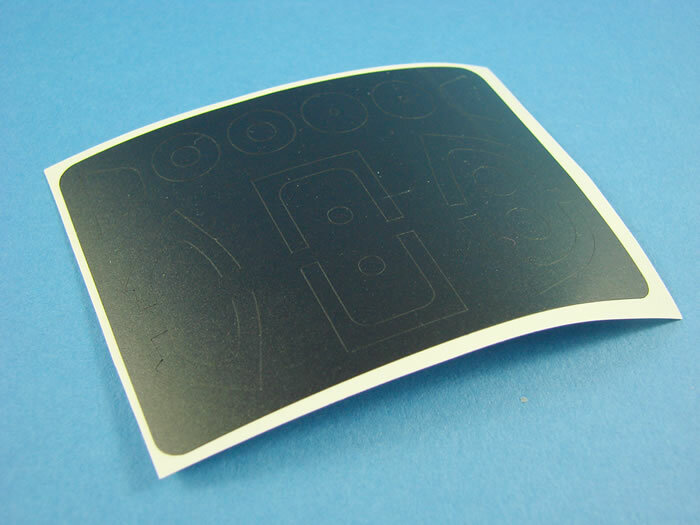 You will need to use liquid mask or infill the mask areas with some tape, as these are supplied as edges only. Two sheets are included, both printed by Eduard, whose decal quality I’ve always found to be excellent. The larger sheet is a single-colour printing in white, containing the various fuselage arrow flashes, crosses of Lorraine, serial numbers, and kill marks. 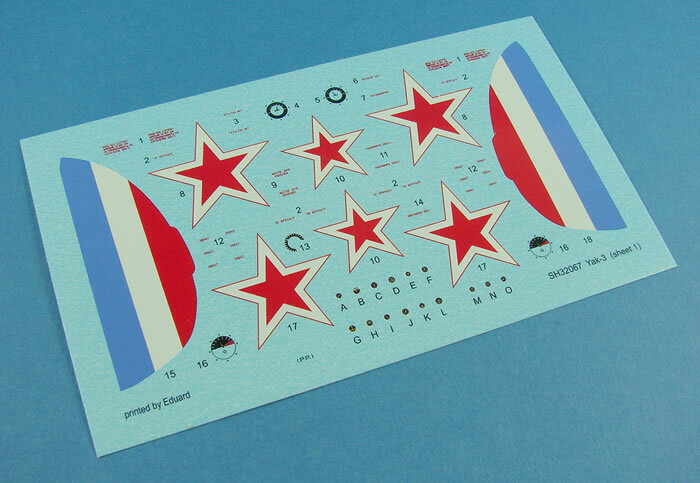 On the smaller sheet, we have multicolour decals for the national insignia, tricolour rudder flashes, instrument decals, compasses, radio receiver decals, and various stencils. 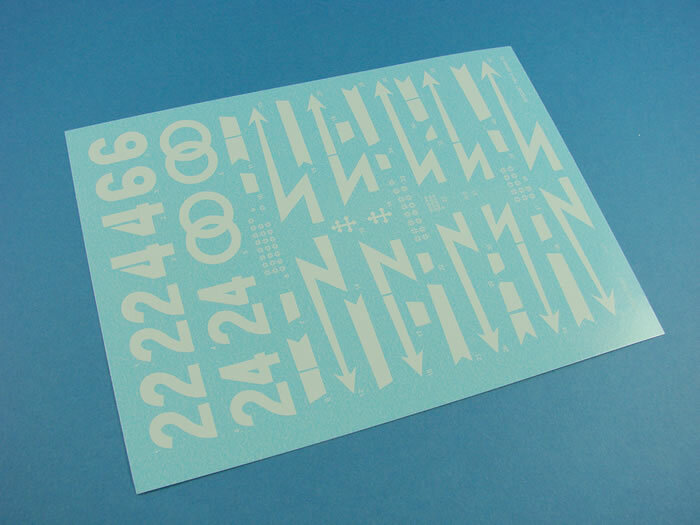 TWO types of compass decal are included, so I suppose you can use which ever you want, as none of them seem to be attributable to any specific machine. This is a glossy, colour-printed 16 page A4 manual, starting with the history of the Yak-3, and the parts plans. 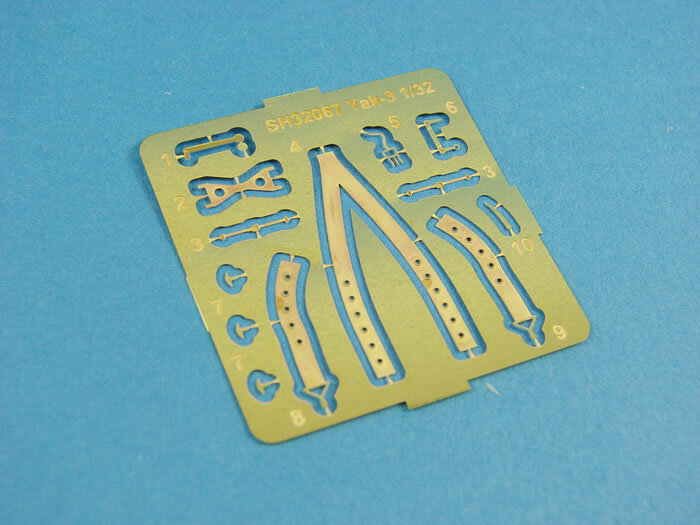 These are useful, as the sprues themselves don’t contain part numbers. Construction is split over 45 steps, with clear line drawing illustrations and colour infill to denote key areas. 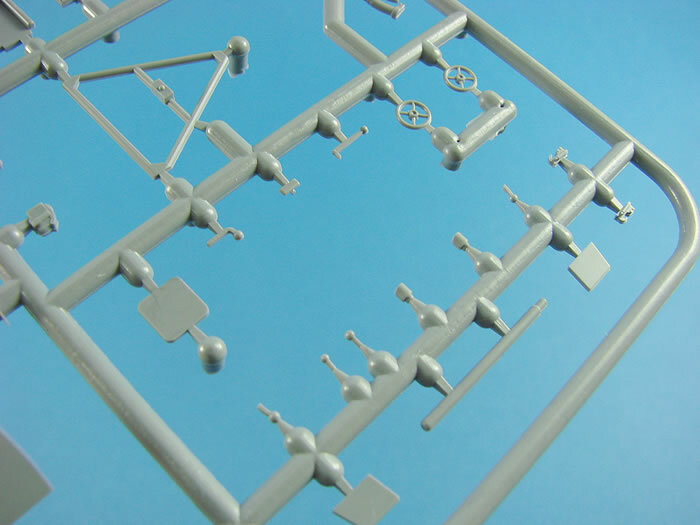 PE and resin parts are clearly denoted, and colour call outs are given throughout, using Gunze-Sangyo codes. 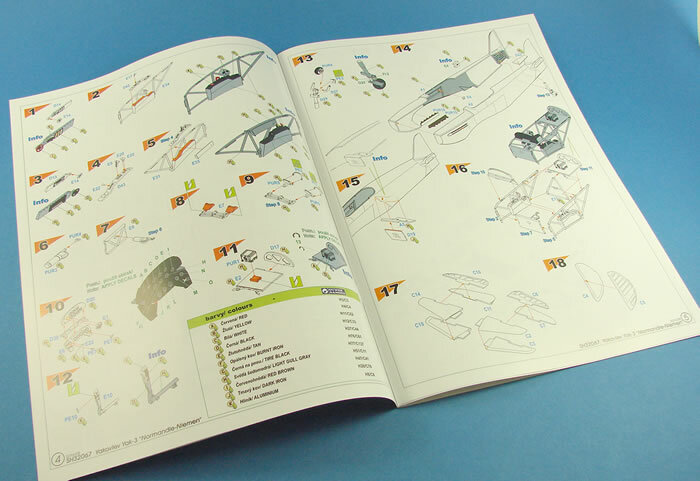 The last pages are given over to the scheme illustrations, again supplied in full colour, with easy decal placement guides. This kit was most certainly worth waiting for. I get the impression that it will be a pretty quick build, but one that shouldn’t leave you wanting, in relation to the detail on offer here. 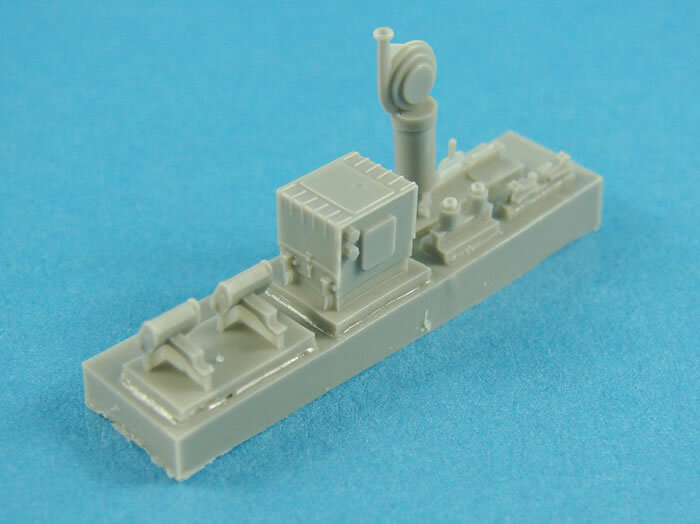 Moulding is excellent, and the kit has a most impressive office and wheel bay arrangement that more than make up for the Yak-3’s distinct natural lack of detail on the wooden areas. The only awkward thing I see is the gear strut construction and fitting being carried out before the model is completed. That’s probably just my own fears though, and not one that at all deters me from wanting to start this one as soon as I can. 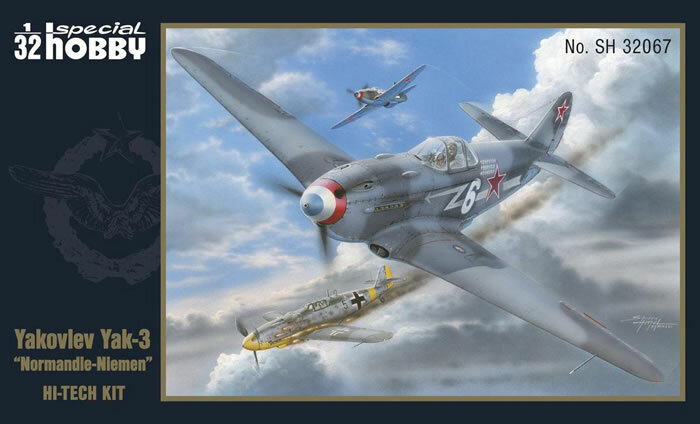 In fact, as soon as my P-39 is off the table, this one is going to be started!